Educate yourself: A Story About Cancer – Joyce's mystery and fiction book reviews with some non-fiction too! Fortunately the author lets you know from the cover that this is a story “with a happy ending.” That makes it easier to read. 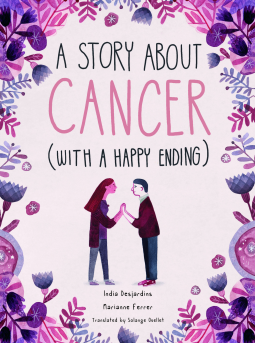 This book is told from the point of view of a fifteen year old girl who has been treated for cancer. She voices feelings that young cancer patients most likely experience but do not, perhaps, share with those around them. For example, the teen in this book does not want to be told that she is brave. She does not feel that she is and she feels pressure to have to be that way, fearing that she will disappoint others. This girl talks frankly about what it is like to be in the hospital, her sadness at the death of a friend and her teenage crush on a boy named Victor. Everything that is expressed feels very genuine. Reading this even though the reader knows the ending from the title, there is suspense. The reader will feel relief as they close the book. I recommend this one for kids of the right age; it will help them to know that they are not alone with their feelings but that others have experienced them as well The book is also a valuable resource for parents and caretakers. It will help them to be more sensitive to the person that is going through the experience. Many thanks to NetGalley and the publisher for an important read.